Monte Cook is one of the most experienced game designers in our genre, and quite probably one of my top 3 favorite designers despite the fact that I never really enjoyed Rolemaster. 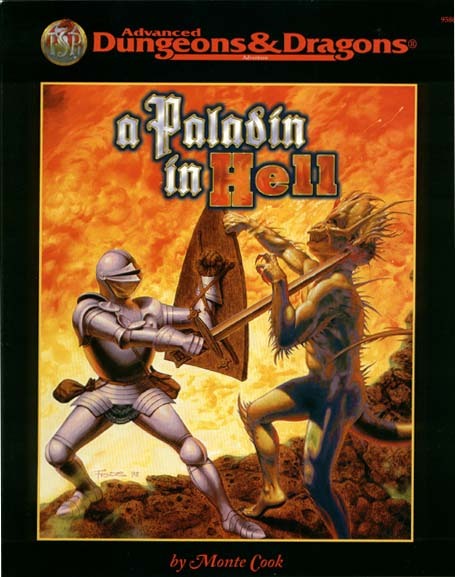 I enjoyed his 2e modules - Labyrinth of Madness was very clever despite its mortality (it was clearly designed with that intent), and A Paladin in Hell was one I definitely enjoyed playing through. 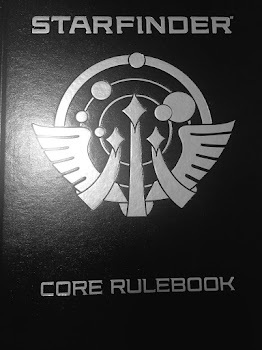 I also enjoyed the Planewalker's Handbook. I was a huge Planescape fan anyways, and sort of still am, but that book and one other (On Hallowed Ground by Colin McComb) are my favorites in that collection. And yes, I still like the inner planes more than the elemental chaos. In a lengthy post last month on his blog, Monte talked about logic in RPGs. It hits a lot of different points and is a good read, if you haven't had the chance to check it out yet. One of the pitfalls he talks about in having a "Rulings not Rules" game - which he reasonably equates with the OSR - is Consistency. A quote from the article: "With tightly written rules, you always have consistency. If the designer's doing his job, things are always explained the same way. For a game where the GM makes rulings, the onus is on the GM to maintain continuity." I agree with this, and I equate it to the Leadership concept of Fairness. Part of being viewed as fair, as a leader in any endeavor, is consistency. Monte goes on to give an example with a climbing check, being easy one time and difficult the next, but that's the sort of mistake rarely seen unless the GM is very new and/or inexperienced. I know we all makes mistakes sometimes, but I would wager most experienced GMs rarely have significant alterations in basic climbing checks from encounter to encounter. Where I've seen and experienced the greatest lack of consistency and fairness is with magic, and this applies to both GMs and game designers. This is explainable, because as humans we live in a world of physics, and have a reasonable idea of what an easy jump is versus a hard jump, or how far a fellow human can fall safely, or how many buses a motorcycle can safely jump over. Or we could look it up online pretty fast when planning an adventure (please, not during play!). Magic is more challenging - by definition, it breaks the basic newtonian laws of physics, by creating energy or matter from nothing, ignoring or flat out reversing gravity, disgregarding inertia, etc. And while only very few games might deal with modern physics like relativity or quantum mechanics, it's safe to say magic, psionics, and the Force all pretty much shatter those as well. Instantly sensing a great disturbance in the Force from a system at least a few hundred light years away? Are midi-chlorians quantum paired? Well, maybe they are. This leads into my theory on the subject: designers and GMs, in my opinion, need to have a solid understanding in the mechanics of magic for their game or world. And by mechanics, I don't mean "1st level wizards can cast 2 spells per day." That's a rule mechanic. I mean the associated, underlying mechanics, within the fiction of the world. For instance, in the Forgotten Realms campaign, there is a great deal written about the Weave. From the FRCS (3e), the Weave is "a kind of interface between the will of a spellcaster and the stuff of raw magic... All spells, magic items, spell-like abilities, and even supernatural abilities such as a ghost's ability to walk through walls, depend on the Weave..." Further, the Weave is the body of Mystra, the goddess of magic. All magic - both divine and arcane - is explained in the context of these basic foundations. Does every player in an FR campaign need to know this? Not really. Shooting magic missiles doesn't require contemplating how a goddess's body convolutes itself to make such an effect possible. But when a player wants to learn Spellfire, it helps to understand that as raw energy of the Weave, it requires Mystra's personal permission to access - and why in certain situations Spellfire can be even stronger (say, where Mystra holds a personal interest). Classic FR concepts like Dead Magic or Wild Magic zones are explained by holes in the Weave or damaged/frayed Weave, which helps a great deal in ad-hoc descriptions or rulings on the effects of spellcasting in such areas. Opposing constructs like the Shadow Weave make a lot more sense in play when the GM understands how and why it was created. I know plenty of people have had fun in FR without their GMs ever knowing much of anything about the Weave, but my experiences in FR were that it all came together just a bit better when the GM kept this sort of stuff in mind - sometimes, it was the difference between an "ok" GM and a "pro" GM. In Planescape, an underlying concept was that while the inner planes were made of actual materials, the outer planes were defined by beliefs. This prevalent concept is essential to long-term PS campaigns, because without understanding that, no one will ever really grasp why gate towns disappear from time to time, or why combat does or doesn't lead to planar expansion. Understanding this foundation of belief might lead to an interesting ruling about no devil being able to touch a pure innocent that somehow lands in Baator. Without comprehension of the underlying basis, such a decision would be effectively random, and more likely to not be ruled the same way twice. Magical consistency is well served by having a solid metaphysical foundation with which to make decisions, rulings, and even fundamental game design. So, contemplate this, and let me know what you think. I'll be standing around in a hole on Mystra's left leg, so as to avoid any flames. Happy to discuss magical logic with you anytime, though it might be best over a few pints.